Located to the south, the group of properties in the Fermont Holdings is historically referred to as the “Cluster 3 Properties.” Black Dan, Jeannine Lake and Penguin Lake are part of these properties. On September 28, 2012, the company granted an option to Cartier Iron Corporation (“Cartier”) to acquire a 65% interest in the Cluster 3 Properties. In order to earn its interest, Cartier must make C$1 million in option payments, issue 2.5 million common shares and incur exploration expenditures of C$6 million over the four-year option period. Upon Cartier earning its 65% interest, a joint venture will be formed to incur additional exploration expenditures. If either company does not fund its proportionate interest in the joint venture, its interest will be diluted and, when its interest is reduced below 10%, its interest would be reduced solely to a 1% royalty. Cartier will have the option to reduce the royalty from 1% to 0.5% by making a payment of $3,000,000. Prior to December 19, 2013, there were no NI 43-101 compliant mineral resources in the Cluster 3 Properties. 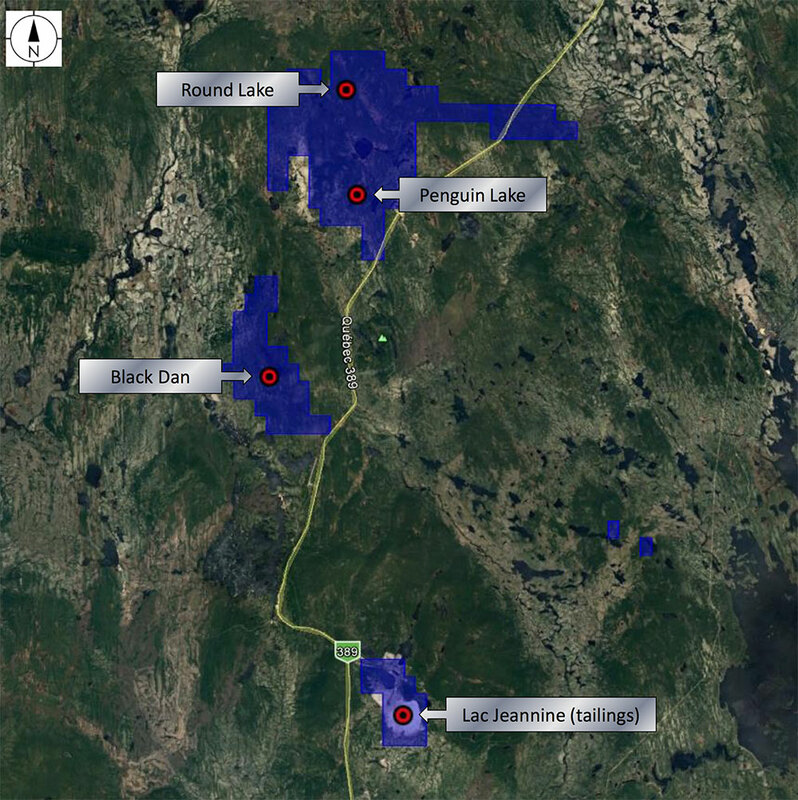 Cartier announced an initial mineral resource estimate for the Penguin Lake Project. As noted by Cartier, the mineral resource estimate reported 531.1 million tonnes grading 33.1% FeT of in-pit inferred resources, at a 15% FeT cut-off grade. The mineral resource estimate was completed by Abder Ladidi, P. Geo., an independent QP of MRB & Associates (“MRB”) of Val-d’Or, Quebec, based on 10 drill holes totaling 3,315 metres, completed by Cartier in early 2013. A summary of the mineral resource estimate and resource estimation methodology can be found in Cartier’s press release dated December 19, 2013, which is available on its corporate website at www.cartieriron.com and is also posted under Cartier’s filings at www.sedar.com. Significantly, the 10 drill holes that define the mineral resource estimate only cover the southern portion of the deposit. The deposit occurs in the form of a multitude of tightly folded synforms that produce a shallow bowl-shaped iron formation host rock. No recent drilling has been completed in the northern portion of the deposit. However, the strong correlation of magnetic response to where iron formation surfaces and a historic drill hole located in the northwest portion of the deposit allow for projection of the modelled iron formation and an estimate of the exploration target potential. The interpreted 3D model of iron formation includes an additional 700 to 900 million tonnes of similar grade as suggested by the current inferred resource, predominantly in the undrilled portion of the deposit to the north and northwest where additional resources might be identified. Additional work to be undertaken by Cartier in the near-term at Penguin Lake includes metallurgical studies followed by a preliminary economic assessment to establish the parameters required for the future development of the project.